Most of us can recognize a syringe, with a needle sticking out of a long plastic body. For many, it is one childhood horror that they can never forget! But while your early years may have been spent dreading a needle, your teens or adulthood might require you to keep a supply of syringes ready for a doctor prescribed medication. When you start your own family, you may need a syringe supply for a family member to treat a medical condition. In this case, not only do you need to forget your old dread of this small medical device, but will also need to know how to use it. Most importantly, you need to know that not all syringes are the same, and that they are used for different purposes. Syringes are available in several different designs and varieties. Most syringes are disposable and many come with an attached needle or with no needle at all. You may select the size of the syringe by the volume of medication it holds. 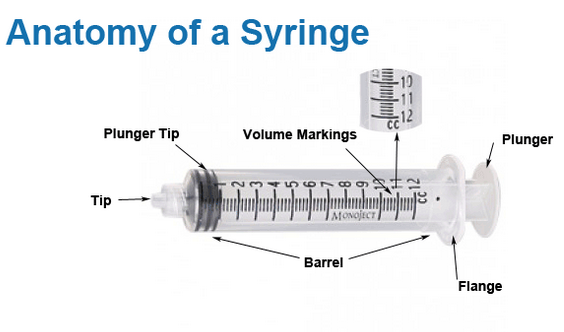 Below are images depicting the anatomy of a syringe and the anatomy of a needle. Syringe selection is mostly based upon the volume of medication to be administered and the desired pressure flow. Volumes are usually measured in centimeters (cc) or milliliters (mL). Both types of measurements are equivalent in volume. A 1 cc syringe is the same as a 1 mL syringe. Large volumes of medication require larger syringe sizes. 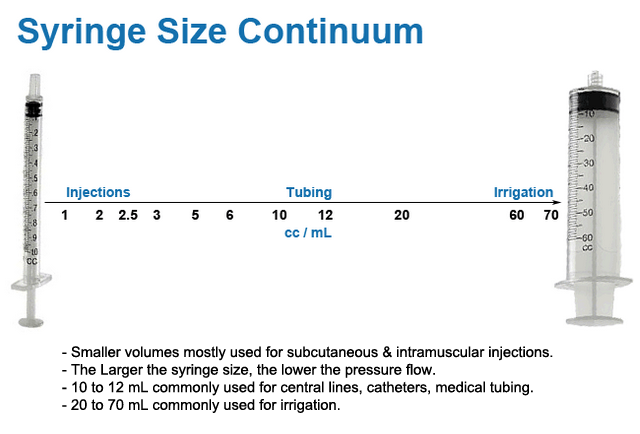 Lower pressure flows also require larger syringe sizes. 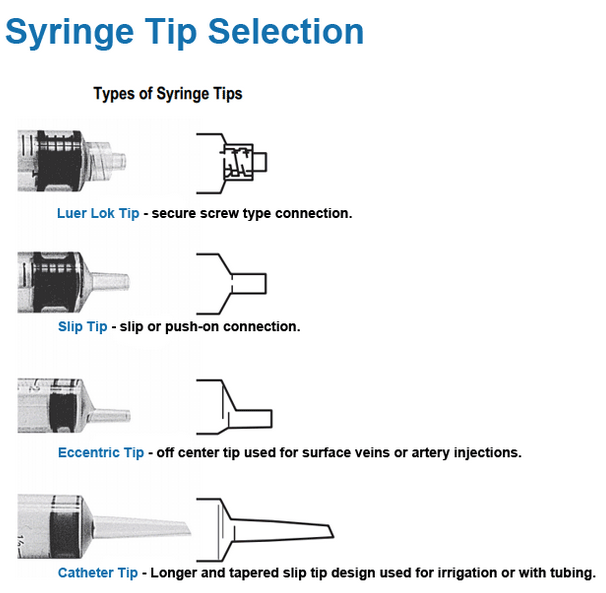 The use of the syringe for injections, medical tubing or irrigation are also factors in syringe selection. A very common type of syringe is the U-100 insulin syringe and used commonly for diabetic medications. It is for one-time use only, and is thus, a very low-cost syringe. Below is an infographic depicting the size of the syringe matched with the use for the syringe. A Luer Lock tip syringe is the most commonly used, as its needle removal and installation is quite easy and quick. The twist mount helps secure the needle to the syringe for greater safety. A slip tip syringe is also very commonly used and allows the user to merely push the needle hub onto the syringe. A catheter slip tip is used mostly used with medical tubing like catheters or feeding tubes. Use eccentric tips when you need to inject a medication parallel to the skin of the patient. It is also used when you want to inject into a vein on the surface, without the needle penetrating through both walls of the veins. Catheter syringe tips are made with a tapered tip to allow tubing to slip on to the tip. Tubing easily slips on and off of the tip. The catheter syringe is used often for irrigation. Needles have a simple design with an hub that affixes to the syringe. Attached to the hub is a hollow needle. The shaft of the needle comes in varying lengths measured in inches. The thicknesses of the needle is measures by gauge sizes. The tip of the needle most often has a beveled tip to provide easier cutting or puncturing. 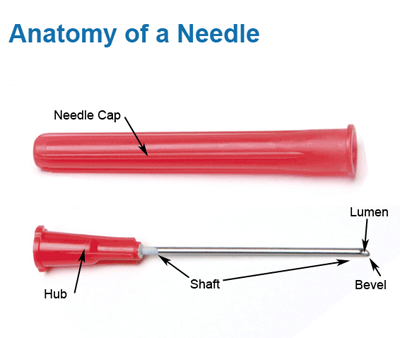 Many needles come with a cap to protect the caregiver during transition from packaging to needle use. The criteria for selecting the right needle has three main considerations--gauge, length and use. Needle gauge is a measurement of the width or diameter of the needle. Length is a measurement from the hub to the tip of the needle. Needle use refers to how deep the needle must traverse to reach the best injection area. 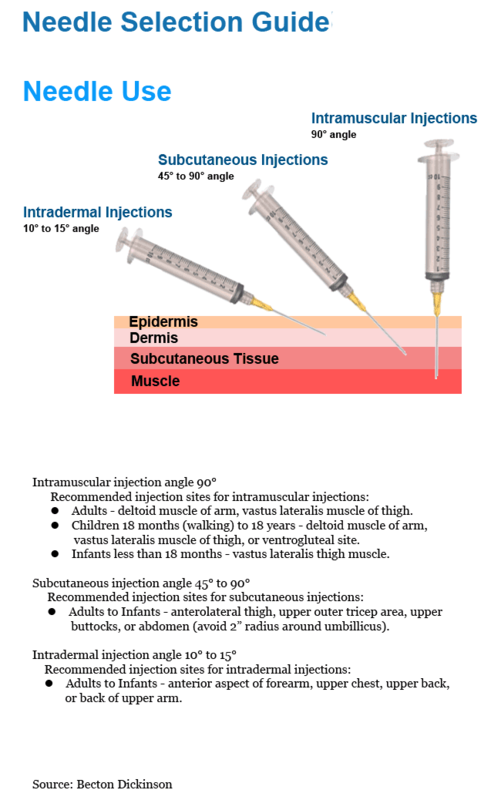 These injection depths are labeled as intradermal (dermis injections), subcutaneous (subcutaneous tissue injections) and muscle (intramuscular injections. Selecting needles by the gauge size occurs by considering skin or hide thickness and depth of the injection. The needle gauge is a series of numbers in which the lower the number, the wider the diameter of the needle. The higher the gauge number the more narrow the needle. Wider gauges provide for thicker viscosity medications and support thicker skin penetration. The most common gauges are 26 and 27 that accommodate all three types of injections--intradermal, intramuscular and subcutaneous. See the Needle Gauge continuum below for more details. Fine gauge needles offer less pain for the patient, while thicker gauges accommodate thick skin and higher viscosity medication. The thicker the viscosity, select a lower gauge number. Gauge numbers are arranged so that the highest number represents a smaller needle width while the lowest numbers represent the largest width. High viscosity medications would therefore use a wider width needle or a needle with a low gauge number. Common needles vary in length from 3/8 inch to 3-1/2 inch. Needle lengths are dependent upon where the injection is being administered. Generally the deeper the depth of the injection, the longer the needle. Intramuscular injections require the longest needle lengths. Common needle lengths for intramuscular injections are 7/8 to 1-1/2 inches. Subcutaneous injections call for a 1/2 to 5/8 inch needle. Intradermal injections require a needle length of 3/8 to 3/4 inch. The 1/2 and 5/8 inch needles are the two most common needle sizes and span both intradermal and subcutaneous injections. Below are three graphics to help select which is the best needle for your needs. When you buy syringes, it is very important that you know which one you actually need. Are you using the syringe with needle for intradermal injections, intramuscular injections or subcutaneous injections? The needle gauge and needle length selection is different for each type of injection. See the Needle Selection Continuum for Needle Gauge and the Needle Selection Continuum for Needle Length infographics displayed above. Below is a quick list of the selection criteria used for purchasing a syringe and needle. Volume of medication to be administered determines syringe size. Viscosity of medication determines needle gauge. Location of injection determines needle gauge and needle length. Make sure you know your needs prior to shopping!